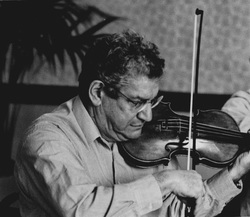 Herbert Light, violinist, studied with David Madison and later with Jani Santo at the Philadelphia Musical Academy. He was a member of the Baltimore Symphony Orchestra and served in the U.S. Army Band before joining the Philadelphia Orchestra in 1960. He has performed as a soloist and recitalist, as well as in chamber music concerts with such artists as Emmanuel Ax, Yefim Bronfman, Dennis Russell Davies, Barry Douglas and Jeffrey Siegel. A founding member of the New Philadelphia Quartet, he has also served as a Music Advisor of the Music Society of Southern New Jersey. In 1989, at the invitation of Music Director Leonard Slatkin, Mr. Light served as an acting concertmaster of the St. Louis Symphony Orchestra. ​Read more about Herbert in our News.